LUCY BURDETTE: We love Spencer Quinn books here at Jungle Red, and before those, we loved Peter Abrahams books. And lucky us, now Spencer/Peter is here visiting! First of all welcome, Spencer (we'll call you that since we're talking dogs today), please tell us a little about the new book. which is the best kind of brainer out there, in Chet's opinion. Things go bad from the get-go, when Bernie mistakes Eben St. John, a mysterious Brit, for a love interest of Suzie's, when in fact he's only a source. Then something not good happens to Eben, and the instrument of that not-good is a gun belonging to Bernie. You see where this is going? Yes, into the maze of an international conspiracy Le Carre or Graham Greene style, except seen through the eyes of a member of the nation within the nation, as Bernie refers to the dog population of the USA. Don't want to spoil the story, so all that I'll add is that it features what I'm sure is literature's first and only dog-versus-drone scene. LUCY: How do you get into the head of Chet the Dog in order to write his character? Is he based on a real dog? SPENCER: Now we come to the fun of this job! I use my imagination. Or it uses me. I just start telling the story in Chet's voice. There's so much discussion of plotting, reversals, point of view, etc. Is there enough about the imagination, the best club in the bag, in my opinion? 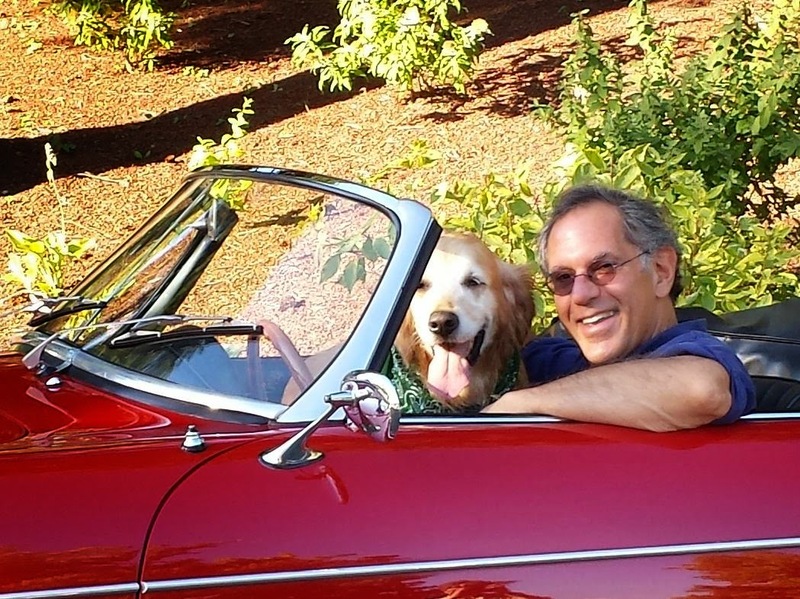 Chet's not based on a real dog, but I couldn't have written him without having had lots of dogs in my life. LUCY: One of things people love about mystery series is the way the characters grow and change. Could you talk about the challenge of this with a dog as the character? LUCY: You've written both stand-alones and series, including suspense and YA.What are the challenges and joys of each? SPENCER: I like doing different things. Doesn't it keep you fresh? One thing about novel writing, as opposed to playing professional baseball, for example: if you take care of yourself you can still be doing it at 80. LUCY: What's up next for you? SPENCER: I'm continuing with Chet and Bernie, of course. 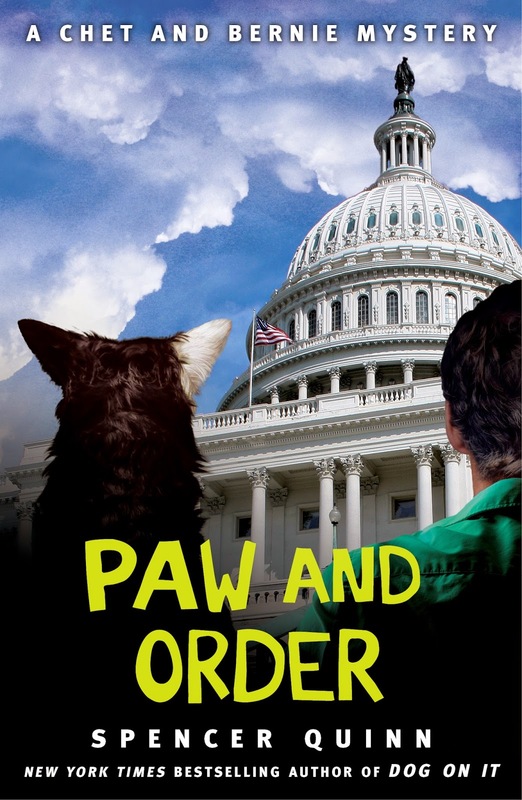 PAW AND ORDER, just out now, will be followed by book 8 next summer or fall. But also, I'm starting a middle-grade, dog-narrated mystery series for Scholastic. Book one in the Bowser and Birdie series, WOOF, comes out next summer. LUCY: And Hank would like to know (in fact we all would! ), when you came up with the idea of Chet the Dog, did your agent love it immediately? SPENCER: Hi, Hank! Well, the answer is I sent DOG ON IT, book one, into her without warning. But yes, I recall a positive reaction. Follow Chet and Bernie on their website, or Facebook or Twitter. Dog-versus-drone? That thought alone is reason enough to add Paw and Order to my to be read pile. Congratulations on the new book . . . . I read and love the first one a couple years back. I've bought books two and three. I really, really, really need to spend some time catching up on this fun series. I'm with Joan: dog versus drone! I fell in love with this series from book 1 Doggone It ... It's the gentle humor and really the love story of a man and his goofy dog Yay Peter! Good morning Mr. Quinn. Love all your books. Love Chet's blog. Do your characters ever surprise you? Well, Bluecat, that does sometimes happen, as most writers will tell you. But what I think it means is that you yourself are sometimes surprising you yourself. There has to be some fun in life. Unknown is me! Having a little trouble with how the comments work here. You have it now Spencer/Peter/Chet/Bernie! Im about to gush, so forgive me.. but truly, Peter, you are one of the most talented writers ever. (And don't forget his Echo Falls series, gang, another treasure!) Even in the most stark of your thrillers, your humanity and kindness come out... ANd I laugh and smile all the way through the Chet and Bernie books. SO---sweet. I do think imagination is one of the best clubs in the bag.I 'm always astonished when I write something then think--whoa, Where did that come from? It's incredible that we as humans are the only creatures (the we know of...) who can come up with something out of nothing. Create worlds that never existed. So amazing. Sadie looks very much like a Sadie my mom had for many years! Welcome, Spencer! And let's hear it for gentle humor. With everything going on in the world right now, we all need a little Chet, I think. Count me in! Thanks, Hank. Speaking of children's lit, maybe I should mention a dog-narrated middle-school mystery series I'm doing for Scholastic. WOOF comes out next summer. As for the photo, that's all due to some fans of Chet and Bernie who brought a '62 Porsche Roadster (C&B ride in a Porsche, but way more decrepit) to one of the signings on the book tour. I'm not a dog person but I love love love these books! Thanks for the peek into the next one (and a way for me to visit DC, which I miss so much). i love Chet and Bernie! Hi Peter! I adore Chet and Bernie! Even if I didn't, "dog vs drone" would make it a must-read. I love the originality of Chet's voice in your books Spencer (Peter). And I have to tell you, I get additional joy out of them because my husband's name is Chet. Just imagine me chortling endlessly over every instance of Bernie shouting "CHET!" So thank you for that. But mostly for the great stories and voice (canine and human). Washington, DC was my home for several years when I worked on Capitol Hill. The great thing about DC was that I could walk everywhere! Look forward to reading your novel. We love Spencer's books! As a dog person, I welcome a pet-tective (I just came up with that on the fly, what do you think? )who's not a cat. Even my oldest, who is evermore not a mystery reader, enjoyed A FISTFUL OF COLLARS, the fifth Chet and Bernie mystery, when she lifted it from my bedside table. And a Porsche in pristine condition, Roberta! Not like Chet and Bernie's. In fact C&B have had 3 so far, each more dinged up than the last. The first went off a cliff and the second got blown up. I spent some time, actually, wondering what sort of ride they should have. I love Chet and Bernie. Glad to hear of P&O's release. The audios are fabulous too. Thanks for the insight into the series. If my husband would comment about my need to buy more and more books, I will simply say, "Blame it on the Reds." I was actually already aware of you, Spencer/Peter, but I had no idea that you were both Spencer Quinn and Peter Abrahams. I find this fact especially interesting because of two books that I have that I keep trying to get to, Doggone It and Down the Rabbit Hole. Now, my brain has been reawakened to these books, they will immediately be moved to my pile of short-listed books. I love the idea of Chet being the narrator. As a long-time dog owner, I often wonder just what my dear doggie is thinking. And, dog vs. drone sounds wildly interesting. I look forward to getting to know Chet and Bernie and checking into the Echo Falls series, too. I love the Chet and Bernie books! Last year, a friend turned me on to them -- so fun. Oh my goodness — the Kiddo will love WOOF! Reds, we've got to have Spencer back for the debut of WOOF! I'm a dog lover and I must read your books! I've had a few dogs who would have loved to put their paws and jaws on a drone. Except for the one who was afraid of blimps and hot air balloons. So much fun to read more about this dynamic duo. I am a huge fan of the Chet and Bernie books. Thank you for this wonderful series. Happy to hear that you are writing for middle grade - I think the kids at the library where I work will love WOOF! Expanding on WOOF for those commenters who referred to it: it takes place in Louisiana, which I love writing about but haven't done much of (except for THE SOUND AND THE FURRY). Bowser's the dog - and narrator - and Birdie's the eleven-year-old sleuth (a word I've never liked). Birdie lives mostly with her grandma who runs a small fishing/swamp tour business in a fictional town on the Atchafalaya Basin. Birdie's highly competent with fishing gear, boats, nature in general. Agreed that we should have Spencer back for the debut of WOOF! Now I have more TBR. Did anyone read a short story called Flush? I think the author was Virginia Woolf. The narrator was a cute dog belonging to Elizabeth Barrett Browning. Yes, the story is about Robert Browning and Elizabeth Barrett Browning. Chet is exactly how I imagine dogs to be...got my mom reading you as well, Mr. Quinn!! Looking forward to the MS series; I have my own MS'ers. Doggone good books. Love Bernie. Love Chet more. He is so cool.